I recently came across an article shared by Entrepreneur magazine entitled, “The Most Important Skill at the Office Isn’t Being Taught in School.” It caught my attention. What is that important skill? The article argues it is curiosity. Curiosity is named by many behavioral scientists to be among the most valuable attributes in the workplace and yet it is not fostered in many schools. In fact, the way in which schools are structured discourages it. It makes sense because so many schools are driven by standardized testing and measure performance solely on test-based standards. Rest assured that is not the case at MPA, and in fact, is quite the opposite. At MPA, curiosity is not just encouraged–it is expected. Furthermore, curiosity is valued as a mindset to be cultivated in its own right, not just for the workplace, but for lifelong fulfillment. According to best-selling author Todd Kashdan, “Curiosity—a state of active interest or genuinely wanting to know more about something—creates an openness to unfamiliar experiences, laying the groundwork for greater opportunities to experience discovery, joy, and delight.” Whether in the classroom, the workplace, or in life, curiosity is essential. There are many ways that teachers at MPA cultivate curiosity. For example, Lower School French teacher Liz DesLauriers values the freedom to “twist and turn the curriculum” to follow the lead of her students. “If a particular group seems curious about something I will change up my plan and tailor it to what they are interested in. For example, I have a group right now that seems particularly interested in the geography of France. It was only mentioned briefly in a lesson, but they showed curiosity and interest in it so I’m going to head in that direction. 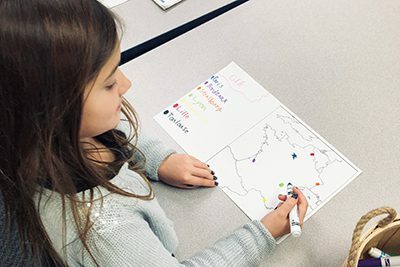 We are now making maps and discussing different cities and landmarks.” Ms. DesLauriers will guide the children to achieve the same learning objectives she had originally intended, but to do that she is following the natural curiosity of her students. Writing for the Harvard Business Review, behavioral scientist Francesca Gino points to research that shows that an increase in curiosity leads to an increase in creativity. In turn, creativity leads to innovation and the ability to discover better solutions to problems. There is also a link between curiosity and critical thinking, communication, collaboration, and problem-solving. A meta-analysis of more than 200 studies found that curiosity influences academic achievement and curiosity with conscientiousness has as much of an impact on achievement as intelligence. “(At MPA,) you can disagree, you can evolve your thinking, and you can question your original stance,” says Upper School teacher Mike Vergin. “This is a place where being curious and informing yourself is cool, and we hold space for the messy process that it sometimes takes to fully develop a position.” Asking questions, working together as a group to think critically about a topic, and listening to the perspectives of others, are all integral aspect of curiosity. Teachers at MPA work very hard and deliberately to create an environment that fosters curiosity so that solutions to problems can be approached creatively and innovatively. Next week, our Middle School students will be taking the Mission Skills Assessment (MSA). The MSA is an online assessment that targets six non-cognitive constructs: creativity, curiosity, ethics, resilience, teamwork, and time management. The MSA was developed by independent schools and is taken by 6,272 students and 542 teachers in 36 schools across the United States. Now in our fifth year participating in the MSA, MPA has gained valuable insights that assist teachers to integrate these important skills throughout the curriculum. The six skills measured by the MSA align with the skills most educators believe are most critical for success in college and in life. When we consider that we are preparing our students for jobs that don’t yet exist, the right combination of knowledge, skills, and competencies result in a mindset that will empower students to tackle challenges successfully. According to last year’s results, 86 percent of students and 100 percent of faculty think MPA develops students’ creativity “well” or “extremely well.” MPA scores (as rated by students) were above the national MSA average in all six constructs. Curiosity is at the heart of dreaming big and doing right. By inspiring curiosity, MPA students learn to approach their studies, and life, with creativity. They learn to ask the big questions that inspire big dreams. They develop the confidence to tackle problems in the face of uncertainty, harness curiosity to drive innovation, and to do right at a time when it is needed most.